Too funny. My WW was "caught" too! Thanks for linking up! We're following you now! She is sooooo cute! What is it with babies and TP????? Oh yes those days of exploring,lol. Great capture, Memories to hide until you need them,lol. I remember when Graham found this fascinating!! BTW.. she is growing so fast!!!! When I saw your post title, I was excited to see what cute Marlie was doing. Maybe she'll be a creative decorator someday. LOL. So funny. LOL. My little one has started getting into the toilet paper and always tries to look so innocent when I catch him. Eek! She's getting ready for high school. It isn't enough to unroll it...they have to rip it up too! We are forever running out of toilet paper so this phase annoys me a whole lot LOL. Too funny..I guess this happens to every parent at one time or another. At least she kept it OUTSIDE of the toilet! She is too cute! So cute! She was definitely caught in the act :) I wonder why they love toilet paper so much? My lady can't open the freezer just yet, but soon, very soon...and then we're in big trouble! Uh oh! 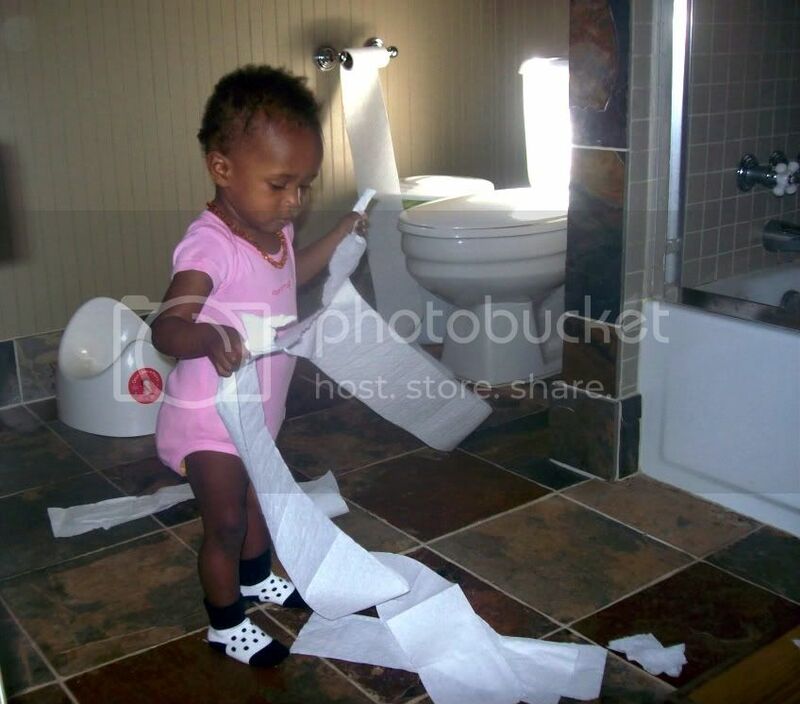 They all eventually find the toilet paper at some point in their toddler years. And they are always so fascinated with it! Ha ha! Too funny and cute! Thanks for the chuckle!